Our vitamin snack. Simply clever. And clean. The dried fruit mix of pineapple and strawberries is a perfect, vitamin-rich snack for the office or directly after training. Dried fruit offer a broad spectrum of all the essential vitamins and minerals and boost your physical and mental performance. The aromatic combination of pineapple and strawberries is like a taste of summer. Our Crunchy Fruits are pure perfection. Their optimal nutrient content requires no further additives like sugar, colourants or artificial flavourings. Instead, they deliver a full, highly-concentrated dose of the vitamins, fibre and phytochemicals you need to stay fit. 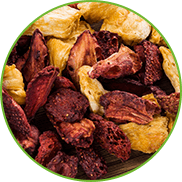 Our dried fruits are produced using patented PÄX vacuum-drying technology. Once harvested, the fruits are carefully washed by hand, cut and pre-dried. Then they undergo the final vacuum drying process where heat is applied. The benefits: The gentle drying process leaves our fruits with 80% of their original vitamin content. Our strawberries and pineapples are strictly quality tested. Only the very best fruits are used and processed. The fruits are washed and then carefully cut and pre-dried for making our Crunchy Fruits. The temperatures are kept under 70°C during the drying process. That is how 80% of their vitamins remain intact. Natural vitamins meet unique flavour. Perfect as a healthy snack wherever you go. Our Crunchy Fruits. In a class of its own. Combined power for fitness. And fun. 100% natural. Dried pineapple and strawberries. 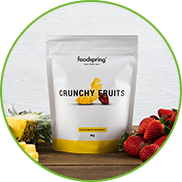 325g of fresh pineapple and 550g of fresh strawberries produce 100g of Crunchy Fruits. A varied and balanced diet and a healthy lifestyle are essential. Crunchy Fruits is a deliciously crunchy snack between meals and can be eaten any time and anywhere. The low calorie content and fresh, natural taste makes our Crunchy Fruits an excellent choice for a small energy boost while travelling, for outdoor activities or as an alternative to sweets as part of a healthy weight-loss diet. 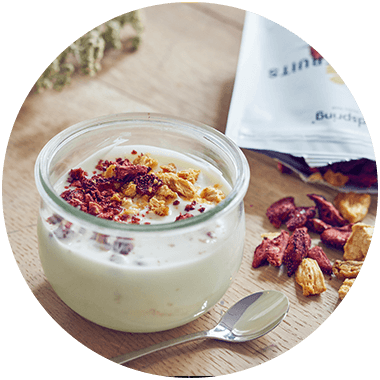 2-3 tablespoons of dried fruit add a touch of sweetness to your morning muesli or protein porridge or your lunchtime salad. Crunchy Fruits are more than just an everyday snack: As a quick energy booster during sports or after a workout, this sweet and crunchy mix replenishes your glycogen stores with its high carbohydrate content. Combined with one of our Whey Protein or Vegan Protein shakes, your body will receive a well-balanced mix of carbohydrates and protein for optimised muscle regeneration. Amazing flavor and an ideal snack. It's something i didn't expect when i ordered it, love it! not so sweet as i thought. really nice snack instead of sweets. Loving those crunchy fruits. the sour pineapple makes a great addition to the sweetness of the strawberries!! will there be more flavours in the future? Wow. This tastes so good. I love the crunchy fruits. Perfect crunch and a nice snack for on the go. After seeing this crunchy fruit mix, I definitely wanted to try it. Dried fruit is the perfect snack between meals. During exercise, at work or as a healthy dessert: It has an exceptionally low calorie density and is full of concentrated, valuable ingredients. 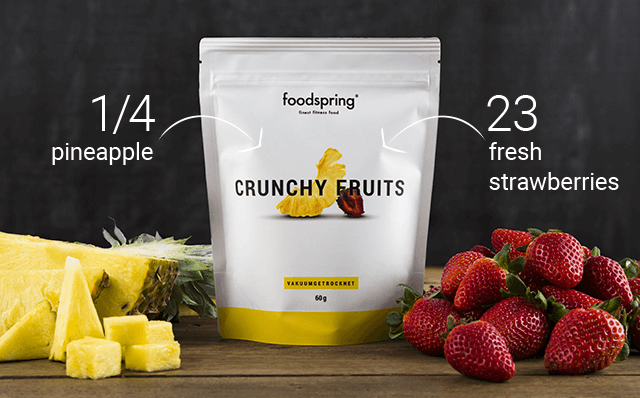 Crunchy Fruits by foodspring contain equal amounts of premium quality pineapple and strawberries. The selected combination of premium fruit supplies your body with a host of essential vitamins, minerals and trace elements. The things you need to ensure optimal performance. 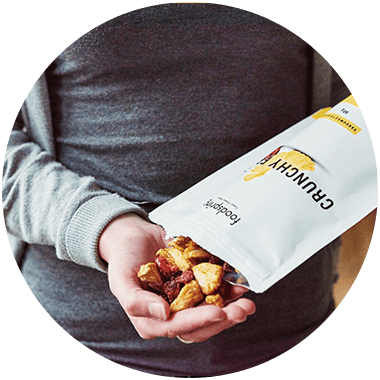 Crunchy Fruits by foodspring are 100% natural dried fruit, free of all additives. Pineapple from Costa Rica and Ecuador and strawberries from Turkey are cut right after harvesting and then sorted and pre-dried in the air. The fruits are meticulously checked by hand to ensure that only the best quality fruit makes its way into our Crunchy Fruits. A gentle processing procedure maintains their valuable microbiological properties. Crunchy Fruits tastes of Caribbean sunshine and leaves a taste of summer in your mouth, whatever the weather. The harmonious interplay of tart pineapple and fruity strawberries takes flavour to a whole new level. The strawberries provide a high fibre content, while the pineapple supplies valuable enzymes. Both are rich in carbohydrates and therefore the perfect snack after a thorough workout. Contains various vitamins, minerals and trace elements which are relevant to your fitness and health. Contains the enzymes papain and bromelain, which assist in the splitting of proteins. Has an alkaline effect and therefore contributes to a good acid-base metabolism. These properties make dried pineapple a perfect snack for athletes and anyone who wants to live a healthy lifestyle. Pineapple contributes to your general supply of nutrients As well as vitamin C with its widely known importance for the immune system, this fruit contains the effective antioxidant vitamin E and vitamins 1-3 of the vitamin B complex. Vitamin B1-3, thiamine, riboflavin and niacin are essential for physical and mental performance. Vegetarians and vegans in particular should ensure that they eat enough foods containing vitamin B, as it generally occurs only in very low amounts in plant-based food. Vitamin B2 protects your nerves and helps metabolise carbohydrates, fats and proteins into energy for your basic body functions. It is therefore linked directly to our performance levels, which is why athletes have a much higher need for vitamin B2. Pineapple also combines the trace elements calcium, potassium, manganese, iron, iodine, zinc and magnesium, which are also essential for a healthy body and top performance in sports and everyday life. As these are directly involved in the function and regeneration of muscles and bones, athletes in particular should ensure that the have a sufficient supply. It is not only the fruit acid that is crucial to achieving a positive effect in this sense, but also the interaction of the various vital substances and enzymes. The enzymes papain and bromelain assist in the splitting of proteins and stimulate digestion. Strawberries are almost 90 percent water, but are deliciously sweet and contain plenty of vitamins. This means you can eat a lot of them without taking in too many calories. With an average 65 mg of vitamin C per 100 g, they are a veritable vitamin C bomb. And because strawberries also contain valuable fibre like pectin and cellulose, they are also great for digestion. The phytochemicals in strawberries are another plus point for your health. They are part of the phenolic acid group and have an antioxidant effect. Phytochemicals protect our body from oxidative stress by binding with free radicals. Strawberries can therefore help us to keep our cardiovascular system on track. A great advantage of dried fruit is the highly concentrated nutrient density in a comparatively low volume. The fruit simply loses volume during the gentle drying process as water is slowly removed slowly, while the healthy vital substances remain intact. That's why selected dry fruits are the perfect choice for anyone who wants to keep physically and mentally fit. 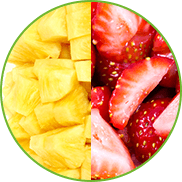 Our Crunchy Fruits combine the positive properties of pineapple and strawberry for a perfect energy boost. 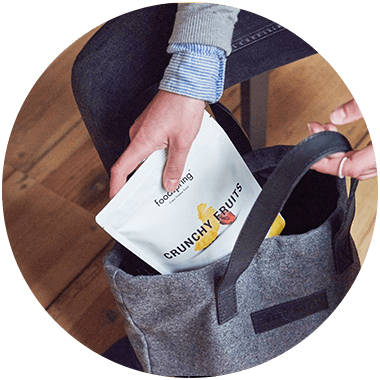 The unique combination of vital substances and high carbohydrate content make Crunchy Fruits by foodspring a perfect snack after training. They refill the glycogen stores of your muscles and aid in quick regeneration. Potassium promotes glycogen storage in the muscles. With 8.8 g protein per 100 g, Crunchy Fruits provide an initial resupply of proteins after training. A piece of cake in the afternoon, a few savoury snacks at work or a bag of crisps while watching your favourite show in the evening - more often than not it is the little in-between snacks with high calorie content and very few nutrients that drive up our daily calorie intake and fuel more cravings. Crunchy Fruits supply your body with essential nutrients. The natural sweetness of dried fruit makes them a delicious and healthy alternative to traditional sweets. Our Crunchy Fruits dried fruits lend your morning muesli a summery taste on dreary days. They enrich green leaf salads or add sweetness to hearty meals - for a holistic and natural taste explosion. The advantages of dried fruit are clear: They have a long shelf life and are super compact. That makes them an excellent choice to take on trips, to the gym, to the office, to the cinema and anywhere where good, nutritious food is hard to find and you're likely to make unhealthy choices. Our Crunchy Fruits are perfect if you have a sweet tooth, but want to stick to a balanced, healthy and figure-friendly diet. They are lactose, soya and gluten-free and contain no added sugar. They are a great option for anyone with allergies or intolerances. Crunchy Fruits are suitable for vegetarians and vegans. 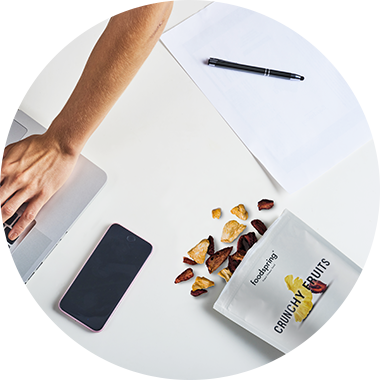 The optimal composition of nutrients, minerals and vitamins in our natural dried fruit provide plenty of energy for everyday life, work and fitness. They contribute greatly to a well-balanced diet for athletes, fitness fans and anyone who wants to eat well. As part of a diet, our Crunchy Fruits can help prevent deficiencies without driving up the daily calorie intake with unnecessary sugary additives. Pineapple contains serotonin, which has a positive impact on your mood and eliminates food cravings. Raisins, cranberries, apricots etc. have had a place on supermarket shelves and online for a long time now. The choice is huge and the differences in quality are very difficult to grasp at first glance. The differences in quality become apparent where the consumer doesn’t really see them: in the manufacturing process. Much of the fruit is freeze-dried right after harvesting, before the final drying process begins. That drying process often entails very high temperatures, which almost completely destroy the vitamins. One very common conservation process for dried fruit is sulphurisation, in which the majority of the vitamins and folic acid are almost entirely destroyed. As sulphurisation prevents the fruit from darkening, products manufactured using this process often have a particularly "healthy" glow. Don't be deceived: Sulphur can cause headaches, nausea and other symptoms in sensitive individuals and must therefore be identified on the label. Have a look at the list of ingredients on the packaging - more often than not, sugar will be the primary ingredient. And it is by no means natural fruit sugar, but instead artificially added sweeteners. They make the potentially healthy dried fruit a high-sugar calorie bomb, which will only give rise to new food cravings. Make sure that the dried fruit is manufactured using gentle drying processes without chemical additives. You owe it to your body to only buy 100% natural fruit, free of sulphur, added sugar and other chemicals. 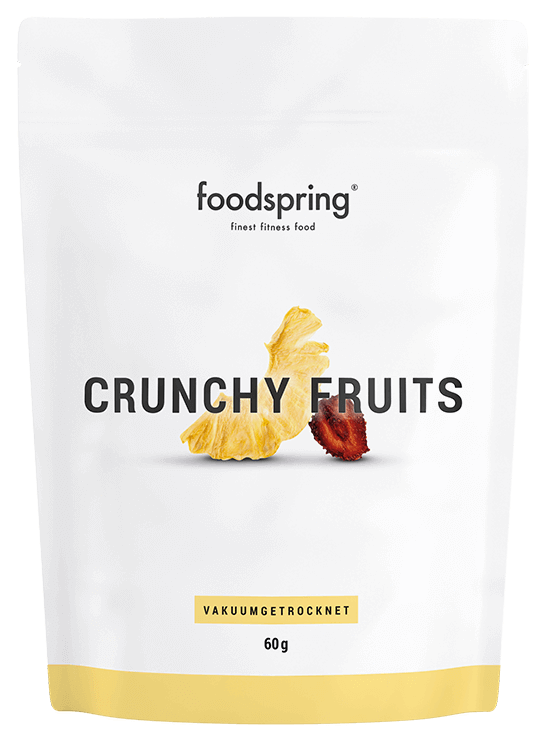 Buy your foodspring Crunchy Fruits made from premium dried fruit right here in our online shop. Pineapple and strawberries? Do they go together? Yes, and they taste great together. The sweetness of the strawberry and the slight sour sweetness of the pineapple are perfect when combined – like a hot summer day in your mouth. Strawberries are little vitamin C bombs and pineapple has been known to indigenous people as a healthy feel-good fruit for centuries. You’ve got to try it! Are dried pineapples and strawberries still healthy? Of course! 80% of the fruit’s vitamins are retained in our patented PÄX-production process. And we use no additives at all – all you get is delicious dry fruit. They are virtually just as healthy as a fresh fruit. Can pineapple and strawberries really be crunchy? Yes they can. Our Crunchy Fruits have the texture of crisps. Mushy dried fruits? No way. Crunchy, not sticky and always fresh. Why should I pay this amount for Crunchy Fruits? Quality is important to us. We set the bar very high for our patented Crunchy Fruits. Hand-picked raw materials, gentle processing and no artificial additives like flavour enhancers or colourants – all of that makes Crunchy Fruits a very high quality product with an unusual and unrivalled taste. How are Crunchy Fruits so sweet if you don’t add any sugar? 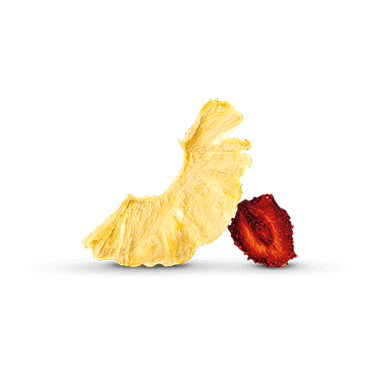 Our special drying process helps maintain the natural sweetness of the pineapple and strawberries. The sweet flavour is simply from natural fruit sugar. What does vacuum drying mean? Vacuum drying is an ultra gentle process that protects nutrients. Unlike traditional drying methods, this process retains up to 80% of the original nutrients contained in the fresh fruit. 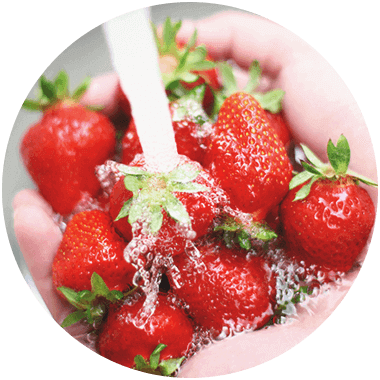 Our pineapples and strawberries are washed right after harvesting, then sliced by hand, pre-dried and finally vacuum dried with applied heat. Crunchy Fruits will be back in stock shortly.